Looking for an all natural litter that is perfect for any cat? If so, we think you will love SmartCat All Natural Litter. This litter isn’t just 99% dust free, but made from 100% USDA farmed grasses with no unnatural chemicals, fragrances, clay free (it is even NON GMO Project certified, and it is biodegradable and a renewable resource, making it the most eco-friendly cat litter out there! Even better, it clumps better than clay and is soft paw safe, making it great for older cat and kittens. Not only does it work better than clay litter, it is also very lightweight, making life better in another way for cat owners! Check out the video below to see why people everywhere are talking about SmartCat! Want to learn more? Make sure to check out Budget Earth's latest article - Make Cleaning the Litter Box Easy with SmartCat All Natural Litter! Would you like the chance to try out this fantastic litter for yourself? Budget Earth and some of their favorite bloggers are excited to offer you this fun giveaway! 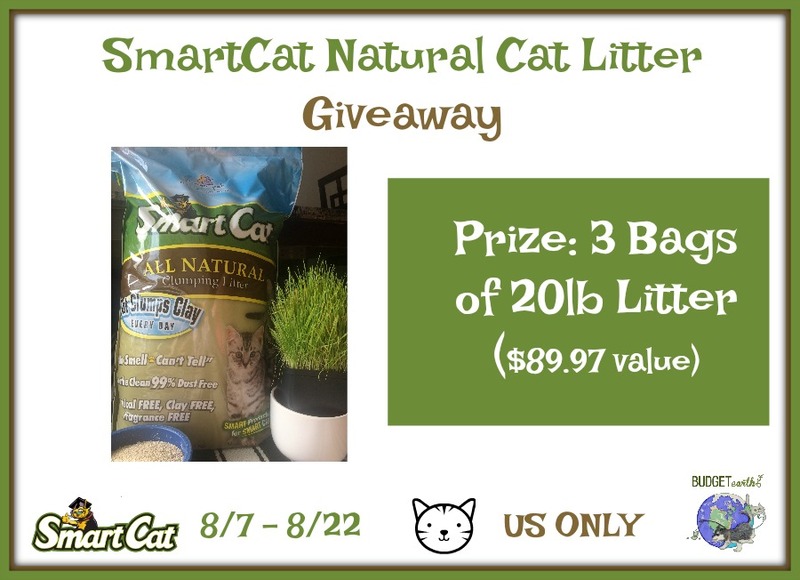 One very lucky reader will win 3 - 20 lb bags of SmartCat All Natural Litter ($89.97 value). To learn more, make sure to read the rules below and then enter through the Rafflecopter! 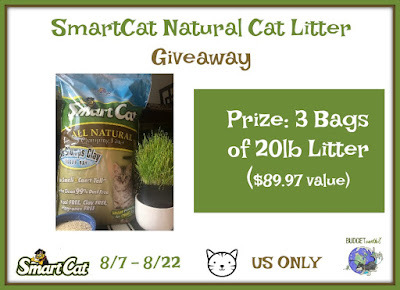 One lucky reader will win 3 - 20 lb bags of SmartCat All Natural Litter. Winners will be chosen at random using Random.org. Sweepstakes ends August 22nd at 11:59pm ET. Budget Earth & participating bloggers are not responsible for prize fulfillment.